until open enrollment begins in November1 1, 2018 for 2019 coverage. Here’s what you need to know for the open enrollment period for 2018 individual and family health insurance plans. Open enrollment starts Nov. 1, 2018, and continues through Dec. 15, 2018. But your coverage doesn’t start immediately. If you sign up between Nov. 1, 2018, and Dec. 15, 2018, your coverage will start Jan. 1, 2019. If you buy after the Dec. 15 date in the states that are extending the enrollment period, you’ll need to check to see when the coverage will start as most still require you to obtain your plan by Dec. 15 for it to start on Jan. 1, 2018. If you buy after Dec. 15 your plan’s start date may be Feb. 1 or March 1, 2019. No matter how long you have in your area, it’s important to not delay in choosing a plan once open enrollment starts. Your prescription drug coverage also could change. The plan may no longer cover the drugs you take to manage your chronic conditions. It’s important that you check your plan’s drug benefits for 2019 before you allow it to renew. You may need to find a different plan for your needs and now’s the time to do it. Health plans must provide an online link to the list of drugs they will cover, known as formularies. Open enrollment is not for auto, life insurance or long-term care insurance. Those are completely separate products that you can buy on your own any time of year. It’s also not for Medicare. The fall open enrollment period for Medicare is Oct. 15 to Dec. 7, 2018. If you miss open enrollment on your state’s health insurance exchange, you won’t be able to sign up for coverage unless you qualify for a special enrollment period. Under the Affordable Care Act, you must have health insurance or pay a penalty at tax time. Coverage only for vision care or dental care. Insurance that covers only a specific disease or condition, such as cancer insurance. Plans that offer only discounts on medical services. For the 2018 tax year, the penalty will remain at 2.5 percent of your income or flat amounts (whichever is more). The 2018 flat and maximum amounts have not been published yet as the government will adjust for inflation. In 2017, the flat amounts were $695 per adult and $347.50 per child. The maximum penalty was set at $2,085. If you owe a penalty, it will be taken from your 2018 tax refund. Unlike nonpayment of child support or other activities, the federal law prohibits the government from garnishing your wages or filing liens to collect an insurance penalty. The ACA individual mandate penalty for not having health insurance has been eliminated for 2019 and beyond. However, some states may replace it with a state-based mandate for individuals to have health insurance or receive a penalty. Massachusetts has had such a mandate since 2006 and New Jersey is starting the mandate in 2019. Other states may follow suit, so be aware of what your specific state may require. The metal level indicates how much cost-sharing they require, explains Bob Fredericks of Fredericks Benefits in Redlands, Calif. Cost-sharing includes deductibles, copays and co-insurance that you must pay until you reach your out-of-pocket maximum limit. Bronze plans have the highest deductibles and other cost-sharing, meaning more spent out of pocket for you when you use your health care, Fredericks says. Silver plans have lower cost-sharing than bronze, and gold plans even lower than silver. Platinum plans have the lowest deductibles and copays, etc. Generally, the more you pay in premiums the lower your cost-sharing. Which plan is right for you depends on how much you’ll need health care in 2018. If you go to doctors frequently to help manage a chronic condition, you likely want a plan with lower copays and deductibles. If you’re pretty healthy, you may be better off signing up for a plan with lower premiums but higher costs when you use your insurance. Of course, it’s a gamble, because you never know what’s going to happen, Fredericks says. When it comes to bronze plans, Fredericks’ advice: “Caveat emptor.” (Buyer beware.) Once you sign up for a level of coverage, you are locked into that level for the year. If you choose a bronze plan and discover you need surgery, you can’t change to a plan with a lower deductible. Health insurers also offer plans outside the marketplace that have a variety of benefit choices. The level of coverage for these services can vary. All the plans in the marketplace must provide consumers with a brief, understandable description of what they cover and how their plan works. The Summary of Benefits and Coverage (SBC) must be posted on the plan’s website. Check out the SBCs for the different plans you are considering. This is a good way to compare plans and benefits. You may qualify for a premium tax credit which is based on income and family size. To qualify, your family income must fall between 100 and 400 percent of the federal poverty level (FPL). If you qualify, the credits can be applied to your monthly insurance premiums. If your income changes during the year and you no longer qualify for the credits when you file your taxes, you will have to repay. Being uninsured for less than three months of the year. You are the victim of domestic violence or suffered from a natural or human-caused disaster such as a fire or flood that damaged your property substantially. A close family member recently died or you had unexpected expenses related to caring for an elderly, ill or disabled family member. You have been evicted from your home or suffered bankruptcy. You found you are ineligible for Medicaid because your state did not expand eligibility under Obamacare. You are not in the U.S. legally. You are incarcerated — either detained or in jail. You also are exempt if you are a member of a recognized religious sect that has religious objections to insurance. Finally, you aren’t required to have health insurance if you live abroad for more than 330 days out of the year. Wear Layers, When Going Out. Throughout the fall, temperatures can begin to feel cooler. However with the fall season, especially in Texas, one can find that it may be warm during the day and chiller by the evening. Be prepared for both instances with a sweatshirt, light jacket, or a hat, according to where you are located. Senior Care and Seasonal Vaccines. Cold and flu season begins in the fall , so getting a seasonal flu vaccine can help prevent unwanted illnesses. Washing your hands thoroughly with hot, soapy water for at least 30 seconds prevents the spread of bacteria and germs. Be sure to lots of sleep to strengthen your immune system to help your body naturally fight intruders. For the elderly that are living by themselves may want to have a professional to check their heating systems. Even for those who reside in assisted living communities, now is an excellent time to grab a space heater or even two for those who feel cold. Never leave them unsupervised. Place at least 3 ft. between the heater and walls or curtains. Outdoor Precautions and Senior Care. Autumn remains warm enough to get out and enjoy outsides activities. 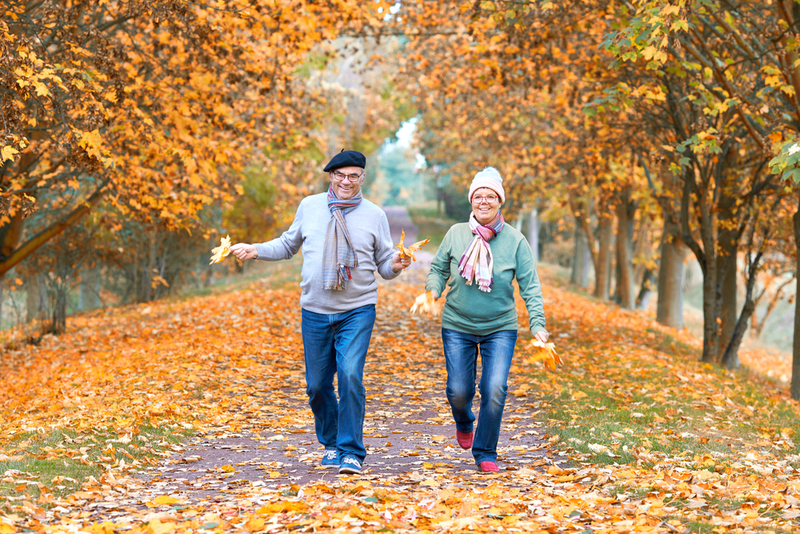 The autumn weather can present certain obstacles for the elderly since rains cause slick surfaces and falling foliage could cause risky and low visible walking conditions. There is plenty of work associated with maintaining a safe outside area and driveways throughout autumn, so hiring a professional service prevents debris buildup and keeps walking paths clear. Store lots of non-perishables and clean water. Keep candles, fresh batteries, flashlights, extra blankets, Sterno fuel and a battery-operated radio available. Keeping appropriate heat levels inside the home is an integral part of elderly care. It is unfortunate that, many people are not able to afford for heating. Senior care and assistance programs provide a safe and clean environment for seniors where they have access to care and necessities to experience a high quality of life.